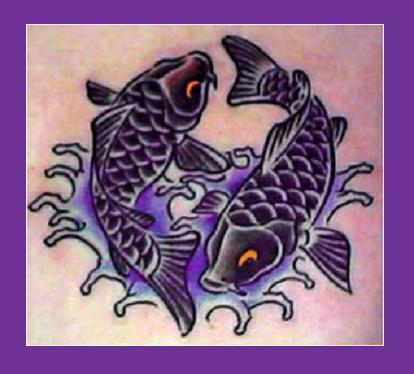 This page displays a collection of printable Pisces Tattoos. Print one out and alter the design to make it your very own. 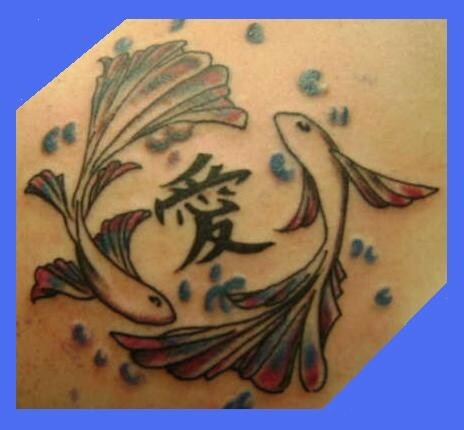 Permanent tattoos are created by injecting pigment into skin tissue using a very fine needle. Permanent tattoos can only be removed by way of cosmetic laser surgery. 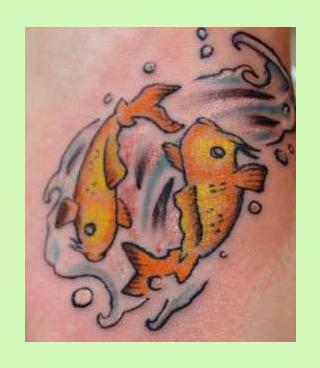 However, temporary tattoos produce a similar appearance that can last several weeks, and does not come of in the bath or shower. The most common style of temporary tattoo is the sticker, which is typically transferred to the skin using water. 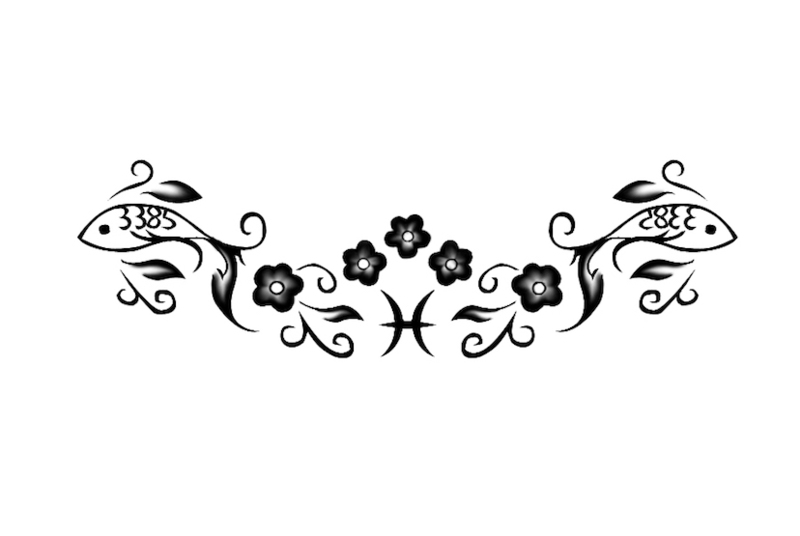 To print these tattoo designs or any other images shown on these pages, just right click on the chosen image and select a SAVE option from your drop-down menu. This will send it to your picture file for future use. From there you can adjust the image as needed before printing. For best results, alter the design to make it uniquely your own before taking it over to your favorite local tattoo artist. Famous writers born under the sign of Pisces include W.H. Auden, Elizabeth Browning, Oliver Wendell Holmes, Jack Kerouac, A. Schopenhauer, Tom Wolfe and John Updike. Famous singers, composers and other musical perforers born under the sign of Pisces include Harry Belafonte, Jon Bon Jovi, Johhny Cash, Nat King Cole, Roger Daltrey, Fats Domino, George Harrison, Liza Minnelli and James Taylor. Famous actors born under the sign of Pisces include Glenn Close, Peter Fonda, Jackie Gleason, Ron Howard, Sidney Poitier, Lynn Redgrave, Kurt Russell and Elizabeth Taylor. Some of the world's most well known Pisces personalities are Buffalo Bill Cody (Western Hero), Nicolaus Copernicus (Astronomer), Bobby Fischer (World Chess Champion), Jane Goodall (Anthropologist), Michelangelo (Artist), Linus Pauling (Chemist), Pierre Renoir (Artist) and Dr. Seuss (Writer), among others.